Vintage Belt Buckle, Good 'Ole Smith and Wesson 38 Special! 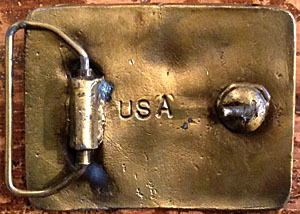 Home > Items just added 4/3-4/17 > Vintage Belt Buckle, Good 'Ole Smith and Wesson 38 Special! Unique Vintage Belt Buckle! 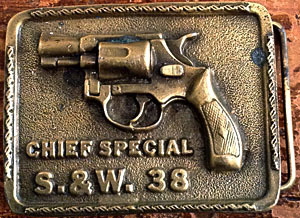 This funky buckle has got a 38 Special handgun right smack in the middle, with the words "Chief Special S.&W. 38" situated below in a thick font. Textured background , with little ropey squiggles along the border. Says "USA" on the back.